How do you mark your spot? Do you like to help other people mark their spot? I do! I have been wanting to try free standing lace (FSL) on my new embroidery machine. I got the water soluble stabilizer on a roll (not sure how long that roll is though.) So I found a design on emblibrary.com that was inexpensive and bought it to try. I hooped two sheets of the stabilizer and used the "embroidery edit" on my machine to place two bookmarks in the hoop. I think maybe I could squeeze three in there - maybe. 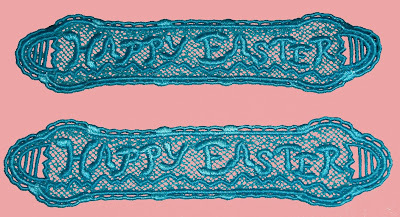 As Easter is fast approaching, they had a "Happy Easter" FSL bookmark file for $1.08 - I love their sale prices! I thought "these will make great little gifts!" What do you think? Would this gift make you happy? These are 1.79"(w) x 6.84"(h) which I think is a nice size for a bookmark. Now, I am wondering if I made FSL bookmarks to sale, how much should I charge for them? (no that is NOT rhetorical-I want an answer - how much would you pay?) Obviously I would need some different designs, but there are a few choices to be found. Oh yes, Accuquilt is announcing the Barn Quilt Contest. There are some great prizes. If you want to enter click the graphic. Gene, those are just wonderful!!! Your bookmarks are adorable. I like that the 2 ends look like eggs. Thanks for sharing. p.s. your mom will love it! Your bookmarks look great Gene! I love free standing lace. From my experience you probably do not want to squeeze three in your hoop. There is something about FSL that it does not stitch out as nicely when you crowd too much in the hoop. Ask me how I know? Great tip about leaving some of the stabilizer in. You are really knocking those designs out. Every time I see your amazing embroidery project you make me want to sink my savings into an embroidery machine! I agree with JanyceR, don't crowd too many into one hoop. use the smallest hoop it will fit in and maximum 2 per hoop. It starts pulling and the stitches won't line up right if you put too many in one hooping. Ask me how I know too!! Wow, this is so far over my head that, of course, I'm impressed! Guess I don't have the right machine (or imagination!). Anyhow, to answer your question, I think how much to charge might be affected by how much is invested in supplies. Etsy suggests using that amount times 5 as an asking price. Of course, that doesn't take into account how much time you spent, but I'm guessing it wasn't a lot with that fabulous machine you have! I'd charge people 25.00 if I were to make it....and no one would buy them...:)...I'd be keeping them all for me! Wonderful bookmarks! I'm so happy to see someone actually using the embroidery function of their machine. I have to admit that mine gets very little use in that area. After seeing what you created, maybe I should give it a try. Oh Gene, I'm so jealous! Me want an embroidery machine so badly!!!!! Whine Whine!! This is all mu husband hears from me. I love your designs and I think Barabra's answer sounds very reasonable. In this economy though, folks are stingy with their pocketbooks. I'm so in hopes when my husband retires in Aug. and we can access our D.R.O.P money (since you're from Ala. you may be familiar with this retirement option for state employees??) Anyhoo, it amounts to a nice little nest egg and we each get 1 item from our wishlist. Betcha can guess what's at the top of my list!! BTW, your package goes out tomorrow! Barbara's suggestion of price sounds about right. They turned out very nicely!!! I can see you're having fun with that machine!! !